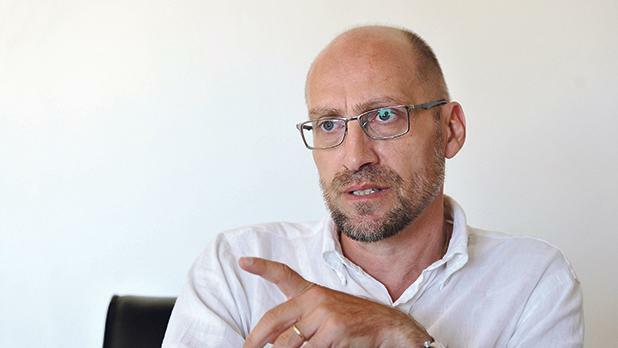 Veteran investigator Jonathan Ferris says he was sidelined at the government’s anti-money-laundering agency (the FIAU) just days after a Russian whistleblower claimed the Panama company Egrant was owned by the Prime Minister’s wife. Mr Ferris spent years at the Criminal Investigation Department before joining the FIAU towards the end of 2016, only for his employment to be terminated last month. This is the first interview he has given. The Egrant claim, reported by Daphne Caruana Galizia on her blog, has been vehemently denied by Joseph and Michelle Muscat and is the subject of a magisterial inquiry initiated by the Prime Minister. On May 2, about a week and a half after the claim emerged, Mr Ferris was informed by his superiors that he was being taken off all government investigations. Mr Ferris, known as a fearless investigator who once even led the prosecution of his own cousin, told this newspaper that he had been perplexed over why he was being asked to step away from the investigations. The FIAU told Mr Ferris that he had a “conflict of interest”, having once arrested the Russian whistleblower after Pilatus Bank filed a criminal complaint accusing her of defrauding the bank. Mr Ferris was told he would be kept abreast of any developments in the investigations. But this, he says, did not happen. Apart from drawing up two reports detailing the agency’s suspicions of criminal activity by the Prime Minister’s chief of staff, Keith Schembri, the agency carried out a wide-ranging investigation into Panama companies belonging to Mr Schembri and then Energy Minister Konrad Mizzi. A leaked extract from the investigation, at the time yet to be concluded, alleged money was transferred to a Dubai company called 17 Black by the local company behind the 25-year-old LNG tanker powering the new gas-fired station. According to the extract, 17 Black was listed as the firm that would pay into the once-secret Panama companies owned by Schembri and Mizzi. Both have denied the allegations, and the FIAU has said no conclusive report exists. Asked why he thought he had been sidelined by the agency, Mr Ferris reckoned it was because they did not want him digging too deeply into the investigations concerning the government. Mr Ferris made it clear during his interview that he could not go into specifics about any of the investigations, as revealing such information carries a five-year jail term. Realising he faced an uncertain future with the FIAU, Mr Ferris held a meeting with the Police Commissioner and Deputy Commissioner. During this meeting, he asked to rejoin the police force. Mr Ferris was told it would be best to wait until after the election campaign, the Police Commissioner promising to get the ball rolling on his reinstatement at that point. The former inspector later found out that promotions and transfers had been given out by the police up until the very last days of the campaign. He contrasts his situation with Home Affairs Minister Michael Farrugia’s announcement last week telling Parliament officers with a criminal record could be reinstated and eligible for promotions. “I have never committed a crime. I have always done my job properly, yet I am being treated like I have the plague. It’s disgusting. His suspicions that his days were numbered at the FIAU were confirmed soon after, when in mid-June the FIAU informed him his employment was being terminated while he was still in his probation period. Like the FIAU’s former head of compliance Charles Cronin, Mr Ferris was told to leave on the same day he was given his termination letter. He was also told it had nothing to do with the leak of the FIAU reports. Mr Ferris describes his termination letter as a badge of honour: “I did my job so well that they wanted to get rid of me. They wanted to silence me. They do not want me to speak out. It was pruning, literally”. The former investigator says that in the run-up to his dismissal, he was tasked with representing the FIAU at various conferences, both locally and abroad. He will be exploring all legal avenues in order to contest his “unfair dismissal”. Mr Ferris’ termination letter shows the decision to get rid of him was taken by the FIAU’s board, chaired by Attorney General Peter Grech. Gozo Minister Justyne Caruana’s husband, Silvio Valletta, also sits on the board as the police representative, along with representatives from the Malta Financial Services Authority and Central Bank. Asked if he thought the Attorney General should be on the board given his role as the government’s lawyer, Mr Ferris does not mince words: “No. The AG should not be there. The police should not be there, and the Central Bank should not be there. The FIAU, he argues, needs to be truly autonomous, with no one “butting in”. As the police force celebrates its 203rd anniversary this year, Mr Ferris also sends a timely reminder that it is there to serve the republic and not the government of the day. In his claim that the FIAU reports were not officially registered by the police under the watch of the Economic Crimes head Ian Abdilla, he challenges the police to provide the reference number of the reports from the correspondence books. Every inspector has a correspondence book, which allows them to trace the movement of every file to which they are assigned, Mr Ferris said. Asked what a police inspector usually does when an FIAU report is received, he said that they consult with their superiors then head straight to the Attorney General after reading the report. Mr Ferris says anti-money-laundering laws give the Attorney General numerous avenues for action in order to ensure an investigation is carried out. On the Egrant case, Mr Ferris accused the police of allowing evidence to slip away from them. Referring to the now infamous ‘suitcase’ episode captured by Net TV, he says: “All the Police Commissioner had to do before going to eat rabbit was phone the Msida branch and get the inspector to open an immediate inquiry. “When I wanted to open an inquiry, I did not ask for the Police Commissioner’s permission. I did not ask for the Prime Minister’s permission or anyone else’s. I would just phone up the duty magistrate. “The inquiry is a farce from top to bottom, in the sense that you do not let time go by before securing the evidence. In a brief statement, police denied Mr Ferris' claim that reports relating to Mr Schembri were ignored by police. "Files were registered and processed as in similar cases," the police said, adding that it was "shameful" that seeds of doubt about the corps' integrity were being sown "through non-existent facts." The FIAU also categorically denied the claims saying it always allowed its officials to carry out their work freely and with the independence their function required. It said it always carried out its duties according to law and in a correct manner and the FIAU management acted correctly and responsibly in its best interests and in the interests of society.